Even those unfamiliar with various styles of woodblock printing from around the world, let alone Japan, are likely to be familiar with what is perhaps the most famous woodblock print in the world: Kanagawa-oki nami ura (The Great Wave Off Kanagawa), by ukiyo-e artist Hokusai. Created sometime between 1829-33, the print depicts what is thought to have been a rogue wave off of Kanagawa, near present day Yokohama in Tokyo Bay. The massive wave has since become nearly as familiar, and as often-satirized, as iconic Western paintings such as the Mona Lisa or The Scream. But beyond the worldwide fame of that particular image, the piece is an exemplar of ukiyo-e woodblock printing, which flourished in Japan for nearly three centuries. 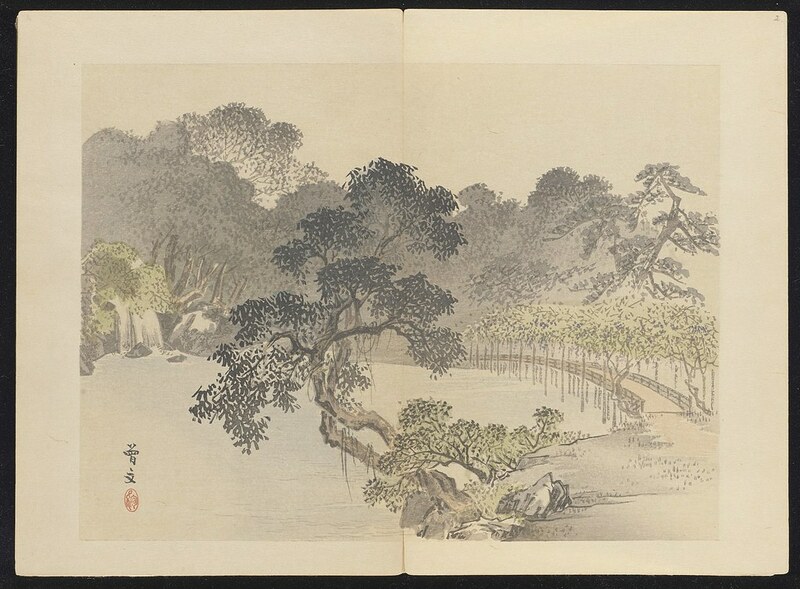 Although woodblock printing goes back to the earliest days of Chinese influence on Japan – printed books are recorded as early as the 8th century CE – woodblock printing came into its own after the invention of moveable type and the introduction of mass printing in the 16th century. The first hero of the story of printing in Japan is Tokugawa Ieyasu, just a few years before he founded the Tokugawa Shogunate that ruled Japan during its two and a half centuries of isolation. Tokugawa was the first to create a native printing system using moveable type that could work with the tens of thousands of Japanese characters – the German Gutenberg, by contrast, only needed to create 26 letters and 10 numbers. The best-known style of woodblock printing in Japan was Ukiyo-e – literally “pictures of the floating world” – the hedonistic world of merchants and artisans that grew up during the 18th and 19th centuries under the Tokugawa shogunate. 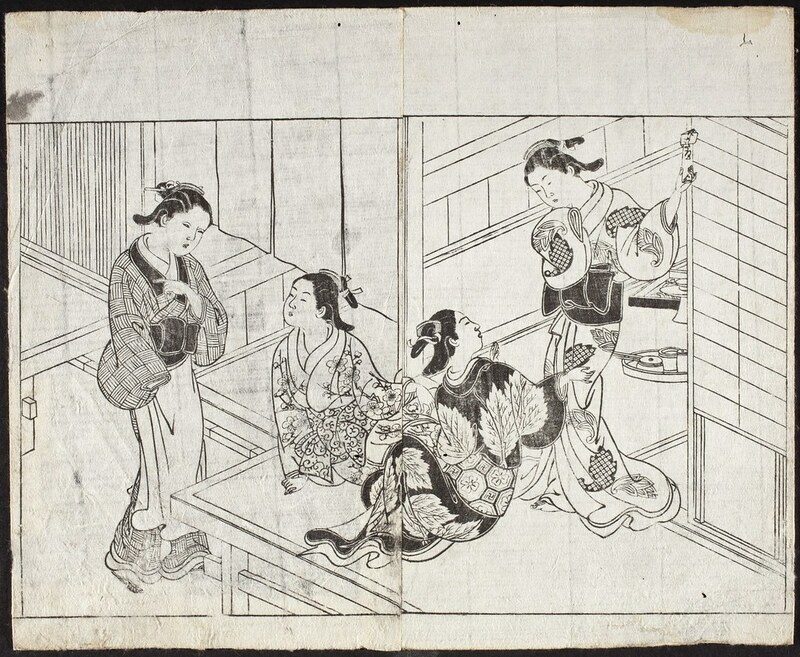 Although the lowest of the four classes of the shogunate were the merchants (the highest being samurai), those merchants thrived under the relative calm of the shogunate, and with their newfound wealth, they discovered the pleasures of the “floating world” and paid good money for representations of it: Woodblock prints of geisha, courtesans, kabuki theater actors and nature were highly-prized and widely-disseminated. The next man to influence Japanese woodblock printing was the artist Hishikawa Moronobu (1618-94), who in 1670 began to create monochromatic prints, and was also the first to produce prints that were not illustrations in books, but works of visual art that stood on their own as single prints. Color was gradually added over the next century, and by 1760 the artist Harunobu was creating so-called “brocade prints” that were made with numerous blocks that added different colors, making him the dominant artist of the period. Later in the 18th century, a number of artists had perfected the complex process and were producing what we now know as the classic woodblock prints, of which the acknowledged masters were Hiroshige and of course, Hokusai, whose above-mentioned The Great Wave Off Kanagawa was the ultimate expression. Their work in landscapes was the final iteration of the ukiyo-e style, as was their focus on the details of everyday life. The process was complex, requiring not just an artist, but four people to produce: The publisher was first, financing the production and hiring the three master artisans who would actually create the work: A painter, who created the original artwork; a carver, who carved the lines of the painting into cured white cherry wood for printing; and the printer, who actually applied the paints to the woodblock and rolled out the prints. With this process, artists were able to mass produce copies of a print, while at the same time making something that was utterly unique, as each print was slightly different, at least in coloration, than the others. After that, with the rapid social and technological modernization of the Meiji Restoration, ukiyo-e went into a steep decline from which it never recovered, though color block printing is still practiced. Still, the Meiji Restoration in 1868, and the subsequent modernization of Japan led ukiyo-e style to be exported, particularly to Europe, where “Japonism” became a hot trend and artists such as the French Impressionists and Post-Impressionists (particularly Manet, Cassatt and Whistler) adopted some of the style and techniques. Vincent Van Gogh went so far as to paint copies of some Japanese originals. Subsequent artists such as the art nouveau master Toulouse-Lautrec made their debt to ukiyo-e even more apparent in their prints (and in many cases, choice of subject matter). The vogue for Japanese woodblock prints may have surprised some Japanese, who considered form to be a mass medium, by no means a high art. Funny, then, that the cover of composer Claude Debussy’s pivotal work La Mer would be published with a woodblock print variation on Hokusai’s Great Wave as its cover. In keeping with the growing appreciation of the form by Westerners, was an American, Ernest Fenollosa, who curated the first exhibition of ukiyo-e work in Japan itself, in 1898. With the ongoing popularity of The Great Wave Off Kanagawa, the position of Japanese woodblock printing in art history would seem to be assured.